Each frame is .1 seconds apart. Jessicah Schipper's time for the 200 m butterfly event was 2:05.64, three one-hundredths of second behind the new world-record winner, Otylia Jedrzejczak. The reason this non-winner is featured is that she was leading the race, as she had done all the way, at this stage but was passed and touched-out by the winner. Since an analysis was done on Otylia Jedrzejczak at the same stage in the race it was thought that perhaps the technique differences between the two swimmers might suggest why Otylia was swimming much faster at this stage. Frame #1: The hands have just entered the water and a kick initiated to counterbalance the vertical force component generated by the entry. The width of the entry is notable and a feature that is often preached but rarely learned by swimmers. Frame #2: The full entry has been completed at a desirable width. The hands are pitched outward, always a poor technique form because usually it leads the hands to sweep outward as opposed to being repositioned immediately to produce a good propulsive position. The legs are at mid-kick. The head has started to lift causing a large amount of turbulence to come off the face. The kick would also serve to counterbalance the head lift. Frame #3: The arms have begun to press outward, instead of being repositioned down and backward. The head continues to rise with considerable turbulence streaming down the front of the swimmer's torso. As well, surface turbulence on the swimmers stomach and lower abdomen shows a detrimental feature of this type of swim suit. The fabric actually creates additional resistance rather than reducing it (slowing the swimmer's progression). As the suit fabric meets the flow of the water at a particular angle, the surface resistance is increased and is exhibited as the milky cover on the suit. In this swimmer, the suit's turbulence creation is also contaminated by some portion of the facial turbulence stream. The swimmer's overall position is in good streamline. Frame #4: The arms continue to press to the side and slightly down, doing little, if anything, for propulsion. Some abduction force of the upper arms is lost in this action. The elbows start to bend. If it were not known that this was a butterfly stroke race, one might assert that this is a picture of a breaststroke swimmer. The amount of frontal surface resistance caused by the swim suit has increased. The head continues to rise and to create considerable drag resistance. Frame #5: The hands still press to the side and slightly down. At least half the propulsive force that could be created by abduction of the upper arms has been lost. The elbows have flexed further. The head continues to rise. It has taken half a second for the swimmer to attain a position where direct propulsive forces are exerted. Frame #6: With a very quick movement, Jessicah Schipper rotates her hands and lower arms to create a full propulsive surface. Unfortunately, valuable force derived through abduction of the upper arms has been lost by this late maneuver. However, the arms are now in a strong propulsive position. Drag force turbulence can be seen in front of the left elbow and upper arm attesting to the power that can be developed from this position. Because of that power and the quick propulsive stage that it will produce, the legs rise preparatory to kicking at this time in the stroke. The vertical force component developed by the arm pull supports the head rising as part of the breathing action. Frame #7: The upper arms adduct as the full arms provide a propelling surface for the swimmer. The legs have risen to their highest point ready to kick downward. The head is out of the water. Surface turbulence continues to be generated by the combination of swimmer velocity and the roughness of the swim suit fabric. Frame #8: The upper arms have ceased adducting, begun to hyperextend backward, and the lower arms have turned to extend at the elbows. The beginning of the upward movement of the upper arms triggers the kick. Frame #9: The lower arms and hands remain in the water pushing backward while "rounding-out". Propulsive forces are diminishing causing the swimmer to decrease velocity. The kick is almost completed. If the timing is correct, the swimmer should begin to inhale at this moment so that inspiration occurs when the swimmer's effort is least in the whole cycle. At this time, the swimmer's angle to horizontal is its greatest. That angle alters the interaction of the suit fabric to the water flow, probably reducing its resistance to some extent. Frame #10: The arms have exited. Final straightening of the legs (hyper-extension of the knees) at the end of the kick occurs. The swimmer rapidly slows because propulsive forces are no longer in effect. The declining velocity and altered body (suit surface) angle does not produce as much friction/turbulence on the swim suit's surface as was revealed during the stroke's propulsive phase. Frame #11: The arms recover forward, the legs begin to rise, and inhalation is complete. Frame #12: The arms approach the water as they swing forward. The head returns into the water and the knees bend preparatory to kicking. This is a position where the swimmer's progression is likely to be its slowest in the whole stroke, and therefore the swim suit will be creating the least amount of resistance in the whole stroke cycle. Frame #13: The stroke cycle begins again as the position exhibited in Frame #1 is repeated. Jessicah Schipper assumedly is very tired at this stage of her race. The almost half-of-a-second that she spends spreading her arms wide underwater at the stroke beginning does little to contribute to increasing her velocity. That could be a major reason why Otylia Jedrzejczak is swimming so much faster at this stage in the race. She does not exhibit an inertial lag of the same magnitude. Not only does the outward push of the arms early in the stroke produce a delay before significant propulsion can be produced, the length of the stroke that results is shortened as well. Fully effective propulsion is not achieved until Frame #6, with the upper arms not having exploited the early stage of abduction in an optimally productive manner. There are features of this stroke that could be changed with an expectation of improved results. Another feature would be to use a different, less turbulence-producing swim suit. 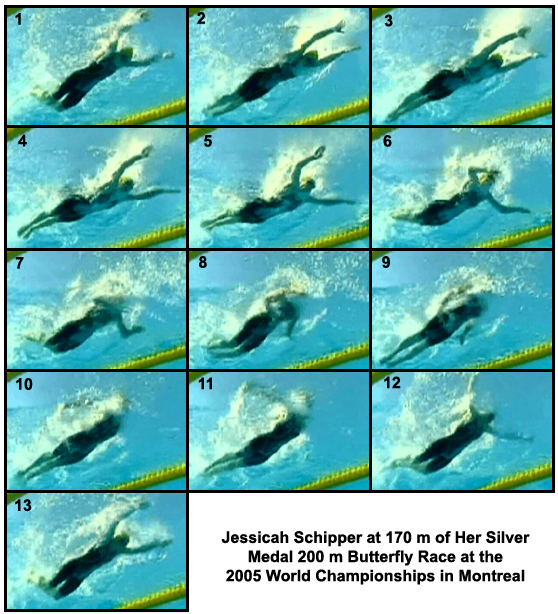 Given the margin by which this swimmer lost the race, the suit alone probably cost Jessicah Schipper the title of world champion in this event.